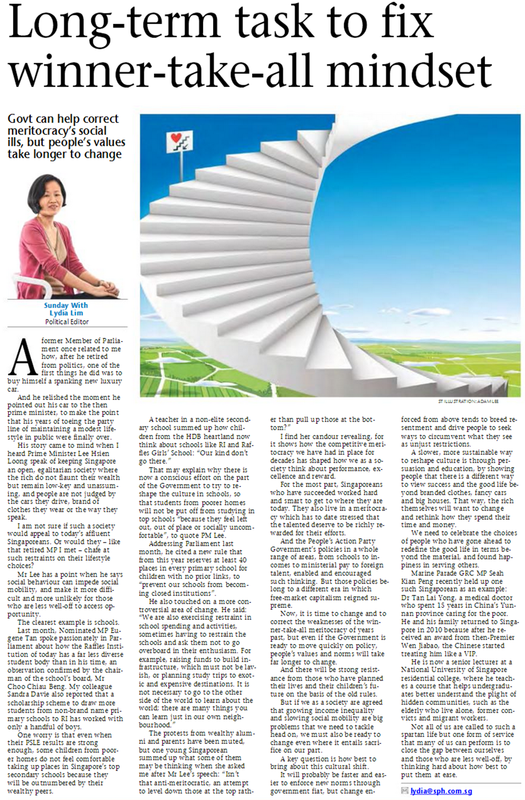 “Now, it is time to change and to correct the weaknesses of the winner-take-all meritocracy of years past, but even if the government is ready to move quickly on policy, people’s values and norms will take far longer to change” (Long-Term Task To Fix Winner-Take-All Mindset, Miss Lydia Lim). The problem with competitive meritocracy in Singapore lies not with the winner-take-all mentality per se (ST, June 22), but with the insistence that academic accomplishment remains the sole yardstick of success. Institutions have been built around this, entrenching those who fit a certain disposition. And unless we recognise the varied pathways an individual can take, the different forms of “success”, the divide between the haves and have-nots will persist. Meritocracy – and by extension competition – is hardly a choice. The frequent refrain that Singapore is small and has no natural resources resonates strongly today, with keener, lower-cost peers hot on our heels. Singaporeans are competitive, because Singapore has to be competitive to prosper. Information and communications technology has changed the rules of the game too. Mere possession of knowledge, a practice encouraged by our standardised assessments, in an environment exploding with knowledge, now counts for less. We want Singaporeans to be competitive. Let us choose where we would like to be competitive at. “Top” secondary schools like Hwa Chong Institution and Raffles Institution may parade their bevy of all-rounders, yet their prestige is ultimately upon the academic success of their students at the national examinations. At every turn the Singaporean student is reminded of the need for good grades. The perception of children from the HDB heartland, that “our kind do not go [to the elite secondary schools]”, is unfortunate evidence of this obsession. Ideally the talented – and perhaps the grafters – should be “richly rewarded for their efforts”. Practically socio-economic disparity has widened the length of starting points. Take the Direct School Admission scheme for instance, a programme for schools to admit prospective schoolchildren based on “a more diverse range of achievements and talents”. Consequently the young ones with families who can afford additional training sessions or enrichment lessons are more likely to do well at the selection tests, camps, skills trials, and interviews. The government, between a rock and a hard place, cannot tell wealthy parents to invest less in their children, and at the same time be blind to the disadvantages of low-income households. It has to make a commitment to diversify the yardsticks of success. The world will not always be kind to the academically talented graduates our universities churn out, and in the future we need all hands on deck – hands with a wide range of expertise. Change initiated by the government does not need to “breed resentment [or] drive people to seek ways to circumvent what they see as unjust restrictions”, if views are sought through participatory processes. Education is the obvious starting point. How can the Education Ministry highlight the multiple pathways available, and encourage students (and parents) to tread upon them? Should we rethink the public sector scholarships and perhaps with the same award tier the financial remuneration based on household income? And what about additional subsidies to help able sportsmen pay for trainings, to help gifted musicians pay for their instruments? “To implement their policies, replace lost talent, and silence the dissent that had nearly torn the party apart in the 1960s, the PAP leadership increasingly turned to people they could trust: talented friends, colleagues, and relatives. Power became increasingly concentrated in the hands of a narrow few. This elite group also reflected increasing homogeneity of values, thought, and experience. Over time, their definition of “talent” accordingly became increasingly limited and reflective of their own qualities and values. The elimination of the dissent became self-reinforcing. Academic performance and CCA performance are as good as any alternate criteria to select elites at a young age. If we use footballing skills as the selection criteria, we will still have an elite. If we let the market decide, then there will still be an economic elite of the top earners. They will run the government. Luckily today, the economic elites have limited influence here, as compared to many other countries. Don’t quite get where you’re getting at – do you want to clarify / expound a little? Thanks. Now I really have to get the book haha.